Mifune is a samurai from the Land of Iron. He is the General for the Army of Land of Iron. Mifune encountered Hanzo in a fight in the past. When everyone escaped, Mifune stayed put and confronted Hanzo. Mifune was inflicted by poison but was given antidote by Hanzo to acknowledge his strength and faith. He was manipulated by Danzo during the Kage Summit. He provided great assistance to the Allied Shinobi force during the Fourth Shinobi World War. Let’s take a look at the abilities of Mifune. Taijutsu,Ninjutsu Lai Giri – May Rain [Prompt]: Causes damage to the opponent’s entire Lineup. Will also cause a selected unit to suffer from Knockdown and will cancel its Shield and all its Buffs. This skill is immune to Interruption. Taijutsu,Ninjutsu Beam of Light: Attacks the opponent’s front row and has a chance of Knockdown. Ninjutsu Kendo Instruction: At the beginning of a battle, increase the Attack and Ninjutsu of up to 9 sword-bearing ninjas from your team by 30% for 5 rounds. Ninjutsu Demon: 2 Standard Attacks will be launched each round. Taijutsu Sword Drawing: Chases and Attacks a Knocked Down unit, causes Knockdown. You can get Mifune from the Kage Treasure. 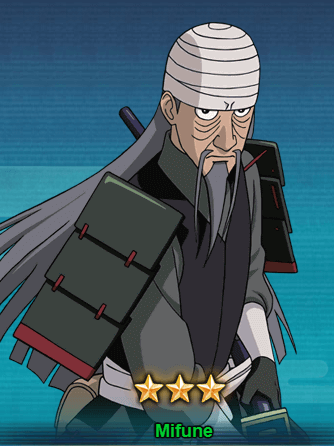 It will take almost 60-70 seal scrolls draw to get Mifune.